Above the back property where we live is one of the oldest Summerland cemeteries where many of our town’s pioneers are buried. In every season, it reminds us to enjoy life while we can. The view seems particularly desolate in winter with snow on the ground, and the presence of the cemetery seems even more urgent. It is not a sight we dread at all. It has always appealed to my Romantic sensibilities. This darker side of winter contrasts with the general cheerfulness of late 19th and early 20th century Canadian painting I discussed in a previous post (5 January 2015). Winter suggests death both as an inevitable end, but also as the harbinger of rebirth and renewal that spring brings. 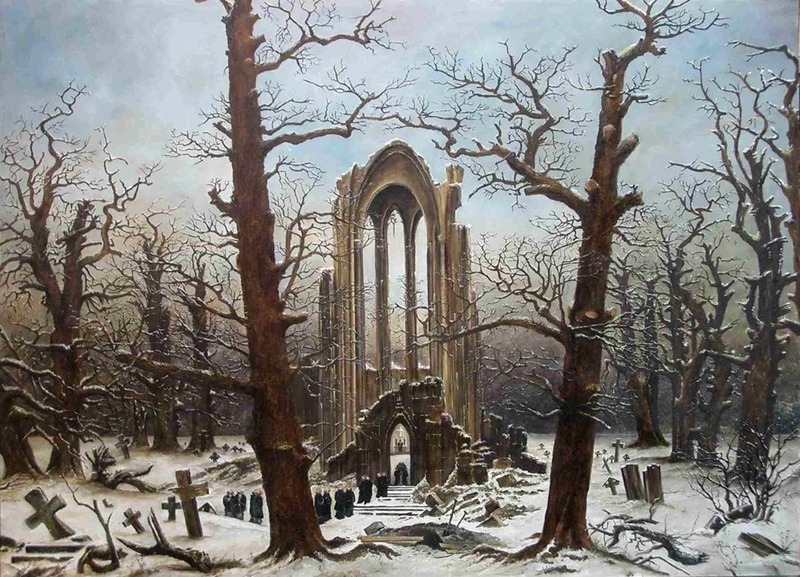 The painting above is Caspar David Friedrich’s Monastery Graveyard in the Snow (1819; 121 x 170 cm), one of the masterpieces at Berlin’s Nationalgalerie destroyed in 1945 during World War II. I am not sure that the colour seen here is what Friedrich painted. Usually it is seen only in black and white reproductions. The painting was a revision of his earlier (1810) Abbey in the Oakwood, and perhaps the added colouration is based on that work. There is lots of symbolism in this painting and the various interpretations can be obtained online. The central theme of winter, however, is the one I wish to focus on here. And to my mind, there is no better expression of winter in the Romantic sensibility than Schubert’s Winterreise, written in 1827 a year before his death. It is a cycle of 24 songs based on poems by Wilhelm Müller (1794-1827). Schubert had used another collection of his poems in his song cycle entitled Die Schöne Müllerin (1823). What both cycles have in common are the themes of lost love, despair, sad and restless wandering (life) and a longing for release in death. This is exceptionally poignant music. Translated texts for both cycles are available online. Performances of Winterreise are also available online, not the least of which is a very fine one with Dietrich Fischer-Dieskau accompanied by pianist Gerald Moore. The piano accompaniments are quite extraordinary in themselves. There are lighter pictorial descriptions of winter in music, of course, and Vivaldi’s Four Seasons come to mind. The last concerto is Winter, and there too, a sonnet accompanied the music, intended more as a guide for the performers. 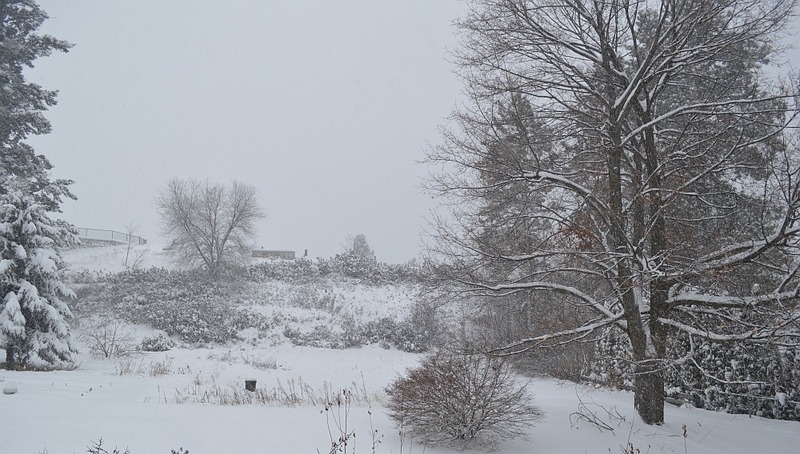 Then there Haydn’s oratorio, The Seasons, where Winter occupies the final part, opens with an instrumental depiction of thick fogs at the approach of winter. Images of desolation pervade the music, and the metaphor of the traveller is again used, wandering a desolate landscape, but relieved by the warmth of a country inn and its folk working at winter activities and telling stories by the fire. All this ends with a reflection on death which the death of nature in winter conjures up. The seasons are a metaphor for life on earth, and the just, affirms Haydn, are rewarded with everlasting life. The music ends with a joyous chorus. Tchaikovsky’s Symphony No. 1 in G minor, Op. 13, is named “Winter Daydreams.” He was 26 years old when he wrote it, and by far the most evocative movement, as far as winter is concerned, is the second, which itself bears the title “Land of Desolation – Land of Mists.” Alexander Glazunov’s ballet The Seasons was composed in 1899 and opens with “Winter,” a lovely piece with musical evocations of hoarfrost, ice, snow, etc. My partner mentioned Chopin’s virtuosic Etude in A minor, Op. 25, No. 11, often called “Winter Wind,” which is most interesting. I had never heard it before. Another terrific piece is the “Winter Storms” waltz (Op. 184) by the Czech composer Julius Fučík. There is a driving energy to it which sounds a bit dangerous! It is one of my favourite waltzes, far more interesting than Waldteufel’s “Skaters” waltz! And for those who would like to acquire any of this music, you will find a very select discography at the bottom of this article. A good CD library is one of the great joys of my retirement. Glazunov: The Seasons, Op. 67; Violin Concerto. Neeme Järvi conducting The Scottish National Orchestra. Chandos CHAN-8596. Haydn: The Seasons, Hob. XXI:3. John ELiot Gardiner conducts The Monteverdi Choir and The English Baroque Soloists. Archiv 431818-2. Sibelius: Symphonies No. 6 & 7; Tapiola. Osmo Vänskä conducting the Lahti Symphony Orchestra. BIS CD-864. Tchaikovsky: Symphony No. 1 in G minor, Op. 13 “Winter Daydreams.” Marriss Jansons conducting the Oslo Philharmonic Orchestra. Chandos CHAN 8402. Vivaldi: The Four Seasons. Nils Erik Sparf, violin; Drottningholm Baroque Ensemble, BIS CD-275.